Where am I? - probably rolling around a deck somewhere from having eaten too much food, still sailing off the east coast of Australia. Only five guest posts left, and I hope you have all be enjoying them. This guest post is from Shanee from Duck and Polish. Shanee is only a new blogger, but I'm sure you will agree that she has so much to offer. Shanee is sharing something different tonight, some frankens. I love reading franken posts to see what people create, and how they do it. I especially love this one because Shanee made one using the colour shifting powder I sold a few years ago. Take it away Shanee. I am super excited and very honoured to be doing this guest post. Cathy was the first blogger I followed back when I was first getting into nail art. She's the reason behind my love for so many brands, the person that inspired my love for holos and multichromes and the reason I finally caved and started wearing glitter bombs. Needless to say, she's played a huge part in making my polish collection what it is today. 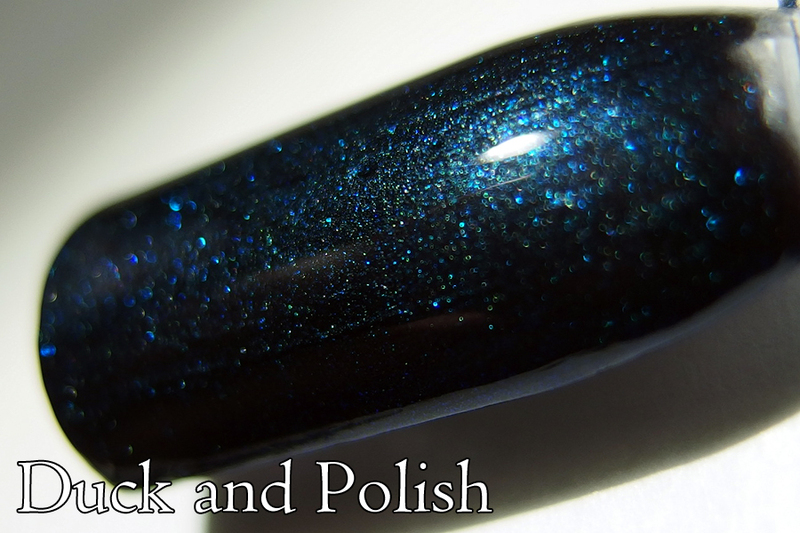 First up is a polish I made quite a while ago originally and then tried to make again for this blog post... and it turned out a little differently. It's also one of the most frustrating polishes I've ever tried to photograph because my camera just refuses to pick up the green starting colour properly. I really dislike naming polishes, but I've called this one "Minstrelsea". This was a really simple polish to make. It involved lightly tinting the suspension base with the black tint from beautyworld, throwing in a few scoops of BlackstarGreen pigment from TKB trading and then about a quarter of a gram of the green-blue shifting pigment Cathy has previously shown on her blog. The second franken was born quite a while ago after a night of staring at swatches of Starry Starry Night at 1AM and deciding that I really wanted it. So to try and curb the lemming, I decided to make my own version. I called this franken "StarDrifter". My biggest problem was that I didn't own any silver glitter at all. So to emulate the "stars", I used Kleancolor Metallic Sapphire, because I'd learned that when it was diluted enough, little silver specks appear. Into that I threw some black tint, a good amount of Ulta3 Midnight and then filled the bottle with suspension base. They are both stunning! I would love to own them both. Gorgeous! Your pictures are gorgeous!! I started following you on bloglovin! I can't wait to see more posts! Shanee how come we have no idea that you did frankens?????? Haha, because I stopped for quite a while before you met me :)!